You can preview great phpFox templates from phpFoxer here. For those who are looking for something unique make sure to check our phpFox theme creation service. Meet our brand new Transformer theme! clean and attractive landing page included. You will get Transformer app with this theme to configure theme right from your AdminCP. We created this theme to be clean and simple. Theme provides animations and various tones of blue with sky background. v1.1 - fixes for notification system layout. customized appearance of all functional elements. 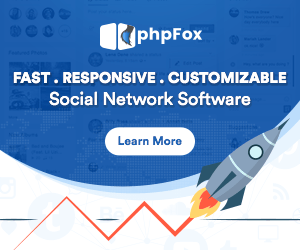 We are glad to announce our new Instagram style theme for phpFox. If you really want to have a special design of your network and make it look as good as Instagram - that's exactly what you need! Facebook-like theme for phpFox Neutron (v4.x). If you want to be on the top, pay attention to LinkedFox theme! Discreet tone of this theme will make you and members of your social network feel your premium status. With our theme you can be the first one how can evaluate advantages of Material Design in phpFox. Pure view will give your members pleasure to work and share positive emotions in your social network. Our theme will give you ability to stand out from the crowd and gather all information needed to have perfect theme on your phpFox instance. special configurable landing page that should fit all gaming needs. Comes with Gaming Theme App that will allow you to configure theme according to needs of your community. This is a great template. Landing page is perfect for adding more info and creating content for SEO, and the added footer controls are a great addition as well. Good job! There were some minor issues with the theme, but phpFoxer team fixed everything quickly. Thanks! Prompt response. Excellent experience. Very supportive to any query. Perfect theme. Recommend. I love this product and the buck up support from PHPFoxer is nothing short of amazing. Thank you so much. There were some problems, but fixed it. Thanks to the guys from Foxer. Great work!